So, this is my first race report for 2015, but today wasn’t a race – apart from a personal one against the clock. My training weeks are pretty full at the moment, and I wasn’t at all rested for this, but the adrenaline definitely kicked in and I really enjoyed it. I’d signed up at the same time as Jon to do the individual 5km swimathon at the Tadley pool. We got transferred to the Aquadrome at the last minute, but in the end it worked out well, as Jon and I ended up in adjacent lanes each entirely to ourselves, so we could see each other for extra motivation but didn’t have to manage bursts to overtake or worry about swimmers coming the other way. I think I probably set pool PBs (at least in the last few years) for every distance from 750m onwards, despite my arms fading horribly from as early as 2km in. I missed 3.8km in an hour by less than a length and my most ambitious target time for 5km by 1 minute. I tumbled 198 out of 199 turns (only missing one to congratulate Jon on beating his 1:15:00 goal by 10 seconds, what an awesome swim!) and my Garmin’s lap counting agreed exactly with the organiser sat on the side, who also provided us with medals, and banana and Mars bar afterwards. The former I wore home with pride, the latter went straight down the hatch without touching the sides! 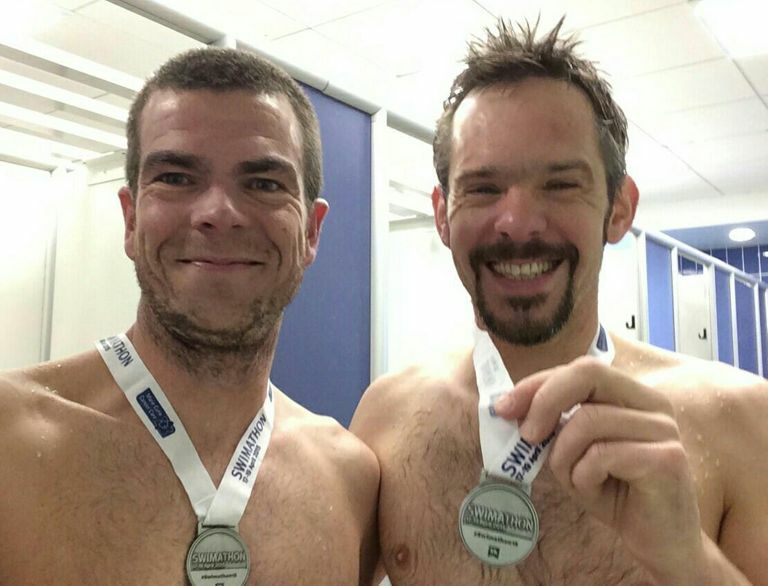 This entry was posted in Races, Swim and tagged Charity, Race report by garethsb. Bookmark the permalink.